At the Vision show in Stuttgart, Germany, Vision Components launched its VC Z intelligent cameras. The cameras are based on a completely new hardware design compared to the company’s older models, integrating FPGA logic and dual-core ARM technology with a Linux operating system. Jan-Erik Schmitt, managing director at Vision Components, said at the show that the new hardware approach was ten times faster than that employed on the company’s older cameras. 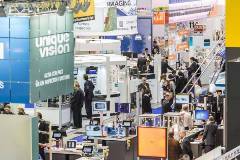 Vision Components’ new offering is just one example of an area gaining traction in machine vision and one which was given great credence at this year’s trade fair, namely embedded vision. The show, which took place 4 to 6 November, returning in a new two-year cycle, had a joint stand for industrial and embedded PCs, and embedded systems formed part of the panel discussion organised by the VDMA. Dr Kai Borgwarth, sales director at Pyramid Computer, a provider of industrial PCs, said that there was a drive to use more embedded systems for machine vision. Speaking during the panel discussion, he said that, with new image sensors outputting more data, CPUs can’t keep up and that GPUs or FPGAs are often needed for additional processing power. And camera sensors can now generate an awful lot of data – while an extreme example, On Semiconductor was displaying a 47 megapixel CCD able to image the individual sub-pixels comprising a flat panel display, while Teledyne Dalsa was showing a 16k line scan camera operating at 2GB/s data throughput. The Piranha line scan camera was among the first products using the high-speed Camera Link HS interface. These products wouldn’t necessarily be part of an embedded system, but even using standard CMOS sensors an embedded machine might still need to offload some of the processing to an FPGA, for instance. The advantage of embedded systems is that they can meet the image processing requirements while at the same time shrinking the size of the device and reducing cost. An ARM board, for example, means vision engineers can develop and program their own embedded imaging system, with their choice of sensors and custom image processing algorithms. Vision Component’s VC Z cameras are equipped with a Xilinx Zynq module for real-time image processing, consisting of an ARM dual-core Cortex-A9 processor operating at 866MHz and an FPGA. Also on the show floor, Allied Vision Technologies, which has rebranded as Allied Vision, was exhibiting its Vimba SDK, the latest version of which supports ARM platforms and programming on Linux PCs. Dr Dietmar Ley, CEO of Basler, commented during the panel discussion that embedded vision technology will become relevant because it allows customers to lower the cost of ownership of machine vision. Dr Ley said that embedded vision and the lower cost associated with it will enable machine vision to enter many more applications. Basler launched its Dart camera series at the show, which, while not embedded vision, is available from €99 to lower the cost of entry for machine vision technology. Basler’s USB 3.0 cameras use Aptina CMOS sensors with 1.2 to 5 megapixel resolution and speeds of up to 54 images per second. The board-level variant measures just 27 x 27mm and weighs 5g. Dr Ley commented that manufacturing lines are now much more flexible, able to accommodate a variety of different products, and that therefore the inspection systems must match this – algorithms and lighting have to be able to be changed easily, which requires a much more complex vision technology. He said that this will allow companies to differentiate themselves. Computing company, Xilinx, was exhibiting for the first time at the trade fair, with the company’s Zynq platform also demonstrated on other stands. MVTec was inviting visitors to see how optical character recognition algorithms in the embedded version of Halcon machine vision software, running on a Zynq platform, transforms handwriting into machine readable characters. Silicon Software was also demonstrating its Visual Applets Tool, which provides a graphical programming approach for constructing a vision pipeline inside the Zynq FPGA. Other companies were exhibiting products that made use of FPGAs for additional processing power. Matrox Imaging launched the RadientPro CL vision processor, which hosts an Altera Stratix V FPGA. The company also provides an FPGA Development Kit for programming the module. The trade fair was a success, with both visitor and exhibitor numbers up following switching to a biennial cycle in 2013.